Branched History 2.0. 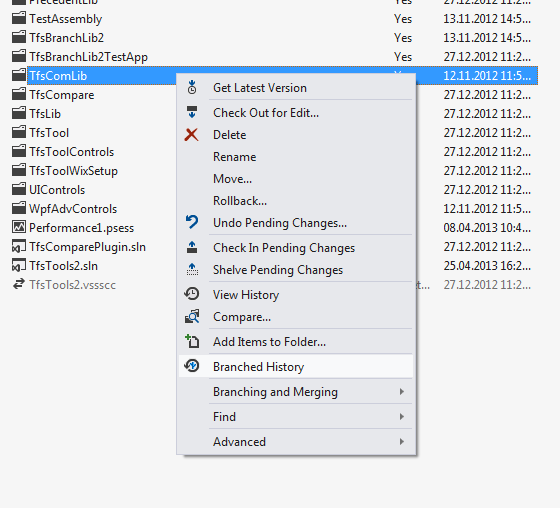 View history for different branches of TFS version control. If you use VS10 go to Branched History (1.0) page. If you click "Branched History", new window will be opened and Path property will be set to the current Source Control Explorer path. The plugin assumes that you should run the command for a branched item. If it hasn't branches it doesn't work. From context menu you can query standard Changeset Details and Compare File (Folder) dialogs.